The Elektoy train line was a #1 gauge series of tinplate manufactured in a small factory in Harrison, New Jersey, during a brief time period in the early 1900's, and has become a highly sought after and collectible commodity. The trains were produced in limited runs and since there are only two years of known cataloguing, and no advertising on a national basis was ever performed, there is not a great deal of information available on this company. The Hoops family (a father-son combination) initially operated the firm as Metal Specialties from 1875 to 1910, making various metal goods with a wide variety of uses. In 1910 the name Elektoy Train Line was patented. Shortly before any trains were produced, ownership passed to the J. K. Osborn Mfg. Co. according to Louis Hertz. Hertz believed that the actual dates of train production were 1911-1913 (see "Riding The Tinplate Rails" and "Collecting Model Trains" both by Hertz). Elektoy catalogs have been found for the years 1912 and 1913 but no other paper trail is known to exist. Elektoy made #1 gauge, three rail, all electric trains with the intention to compete in the middle of the toy train market. At the time, the lower end of the market was primarily 'O' gauge trains made by Ives and German imports. The upper end of the market included Ives, Märklin and Bing #1 gauge and Lionel's Standard gauge trains. 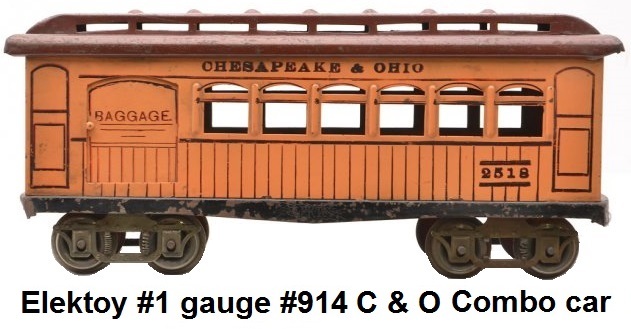 #1 gauge is 1 ¾ inches (1.75 inches or 44.45 mm) between the outside rail heads, making it larger than 'O' gauge but slightly smaller than wide (Standard) gauge. It is also often referenced as being 1 ⅞ inches between the outside rails. The scale for #1 gauge is typically ⅜ inch to 1 foot. In those days, train sizes were defined using gauge, rather than scale. 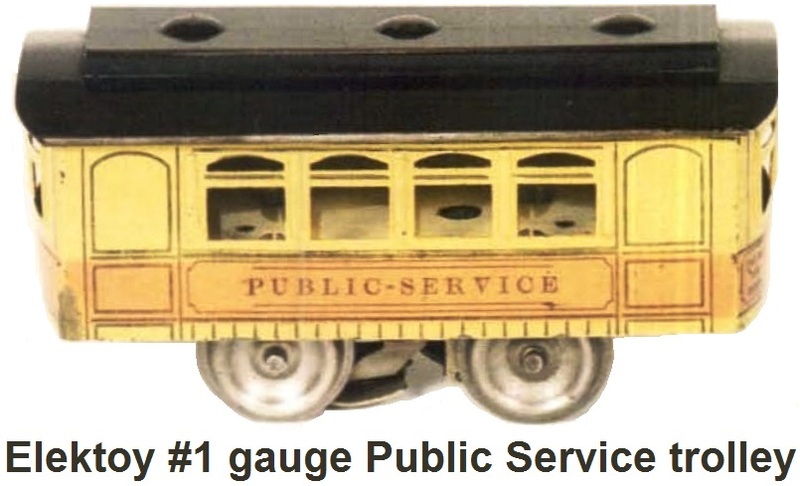 The four primary gauges having standards adopted were #0 (commonly called 'O' gauge today), #1, #2 and #3. Elektoy only created 0-4-0 type locomotives in electric and steam outline. Passenger and freight cars were basic, looking a bit like a cross between Lionel's smaller series standard gauge cars and Ives lithographed #1 gauge cars. The cars were painted and had rubber stamped roadnames and details. The Elektoy #905 steam outline locomotive was made in brass and appeared similar to Lionel's #7 locomotive. However, unlike the #7 or #6 special, the Elektoy brass engine is the most common one to find of the series. 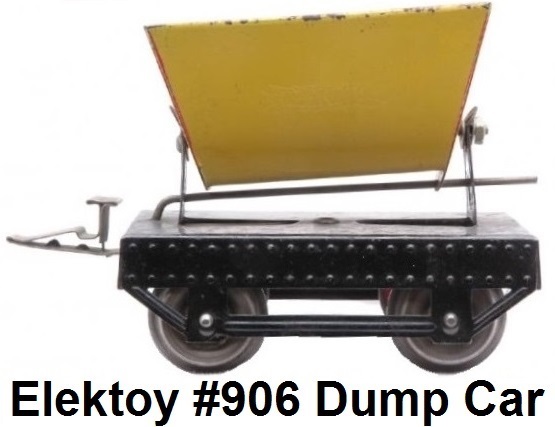 Elektoy produced eight different freight cars: a #906 operating dump car, a #907 hopper, a #908 combination lumber/flat car with removable stakes, a #909 gondola, a #910 stock car, a #911 box car, a #912 caboose, and a #938 tank car. These cars were all equipped with nickel trucks and brake wheels. The #906 dump car only had 4 wheels, and was available in either red or yellow paint. The dump bin could be tilted to dump the load. The remainder of the freight cars were equipped with 2 four wheel trucks. 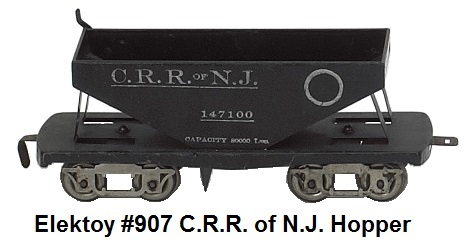 The #907 hopper and #908 flat cars both came in black. The #909 gondola was offered in red or yellow, but brown ones have been discovered. The #910 stock car came painted in red or yellow, and was availble with either a brown or gray roof, it also had sliding doors. The #911 box car came in either red, yellow or orange and was also equipped with sliding doors. It was lithograhed as either a 'Fast Freight' for one of these lines: Pennsylvania Lines, Union Lines, New York Central Lines, or NYC and HRR, or can be found as a "Refrigerator - DairyProducts Express" with Despatch Transportation Company lettering. 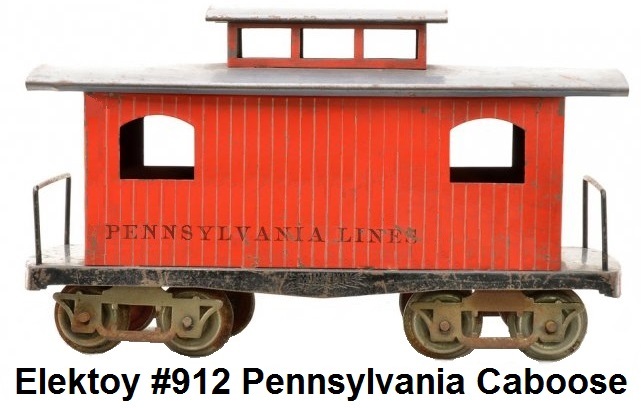 The #912 caboose was offered in red or yellow with Pennsylvania Lines markings. The #938 oil tank car was only found in red. Elektoy offered the #907 hopper in two road names: Keystone and CPR of New Jersey. These freight cars were outfitted with a patented set of couplers that were riveted to the oar underframe of each car. The unique design employed a long T and V male coupler (one on each car) that engaged a body slot in the adjoining car. The name Elektoy was embossed on all car and tender frames. The Elektoy line was characterized by very low prices. 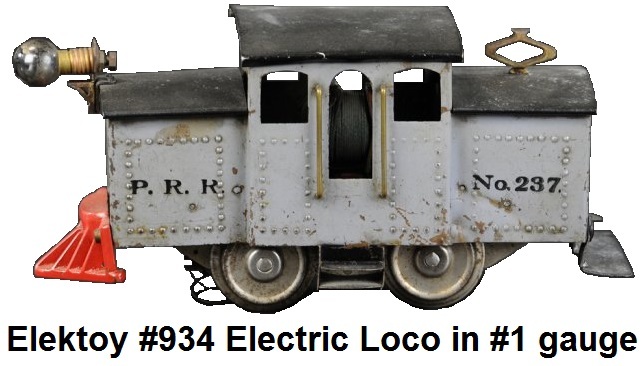 The #904 electric outline type loco, which was made of brass and steel, equipped with side rods, reverse, and a headlight, sold for $6.00, with track. It was hand painted in maroon, gray and black. Livery was for the PRR, and the cab was numbered #9. It was modeled after the S-1 Electric prototypes that ran on the New York Central RR during this era. 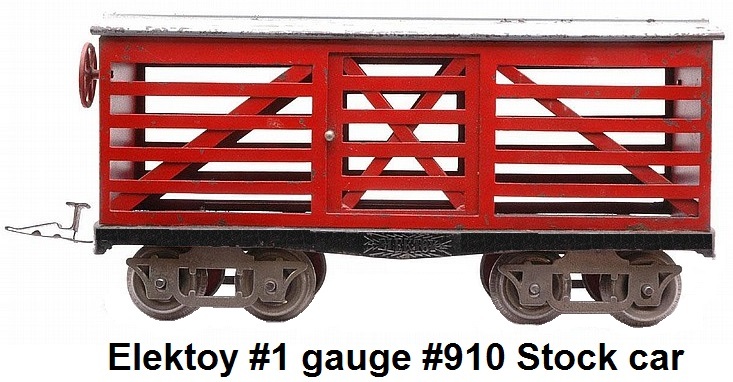 The lettered numbers on Elektoy locos and cars did not correspond to actual catalog numbers. Elektoy steam type locomotives (#903 & #905) were made entirely of metal and included a bell, an octagonal headlight with pedestal, rivet detail on the steamchest, boiler and bunker. The Elektoy name is engraved on the steam chest. The steam type loco bodies were removable without requiring the use of any tools. This was accomplished by unscrewing the locomotive's smokestack, then the boiler could be swiveled back on a hinge located under the cab. This allowed access to the motor, frame, and running gear to facilitate replacement of brushes, oiling of gears and bearings, and cleaning directly from the top of the motor (Voltamp - Boucher trains provided this identical feature). The same motor powered every locomotive in the line. It had a six-pole armature, a horseshoe field, steel laminations, a bronze commutator, and mica insulated gauze brushes. Motors were equipped with reverse sWitches, were well made of good materials, ran very smoothly and quietly, and pulled long strings of cars. Locomotive wheels were made from hollow stampings, with eight wide spokes. Tenders employed 8 wheel trucks, and imitation coal piles. 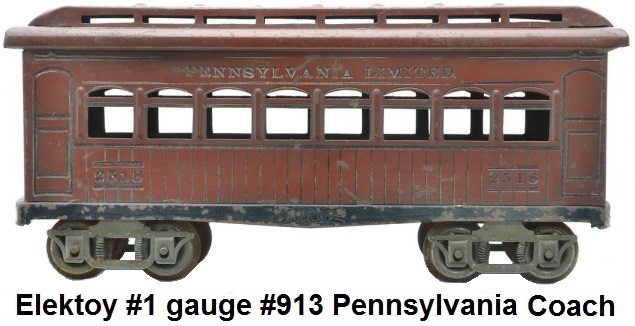 Elektoy passenger cars were primarily made in three 11 inch types - a #913 coach, a #915 pullman, and a #914 combine. The coach was available in orange painted litho with a Cheseapeake and Ohio road name, in a maroon and tuscan painted litho with the Pensylvania Limited lettering, or in blue painted litho with the New York Phila Balto Washington lettering. The #915 Pullman was offered in orange labeled as the Richmond, in dark red lettered Electro, and in maroon and tuscan, also lettered Electro. The #914 combine car provided the most variety of choices, offered up in yellow with the liveries of the New York Phila Balto Washington, or in red with the same road name, in orange as Chesapeake and Ohio, or in dark red as the Pennsylvania Limited, in maroon and tuscan with either Pensylvania Limtied or New York New Haven and Hartford, or in blue with New York Phila Balto Washington. It was very common for Elektoy to issue their passenger sets with mixed cars of different road names and colors. Only one set, the Pennsylvania Limited in maroon and tuscan came with matching cars. All passenger cars were equipped with two 4-wheel trucks, and for some unknown reason, were always labelled with the #2518. The coach and combine cars had windows punched out, but the doors had lithographed windows. The Pullman car, always had cut out windows over the doors, nickel air tanks and an electric light. This was the fanciest car and retailed at $2.50, a dollar more than the combine or coach which cost $1.50. These passenger cars were outfitted with simulated sprung trucks (freight cars utilized the same trucks, but without the springs), but no individual couplers. Passenger cars were joined using two couplers riveted together loosely enough to flex when the trains were traversing curved tracks. Theses couplers were never permanently attached to the car bodies. A very rare set of smaller 8 inch passenger cars was catatlogued as #937, and used the same body as the #901 trolley. These came painted in a light bluegray color, and were lettered for the NYNH&H. The #903 steam outline loco was finished in gun-metal, as was its tender. It had a shorter boiler than the #905 and one less sand dome. However, it used the same frame and drive mechanism as the #905. The #903 boiler, cab and tender body were made of sheet steel. Early #903's were equipped with a coal bunker and no tender was provided. The later #903's may have come with a very rare 4-wheel coal tender or the more common 8-wheel coal tender. The 4-wheel tender was described as a simple 3-sided sheet steel wrapper soldered to a #906 dump car frame and painted black. It had no rivet detail or lettering. The #905 had a polished brass boiler, and solid brass parts thruout. It came in an unpainted natural finish, with a nickel plated cab and nickel plated chassis component parts, including details such as an air compressor, hand rails, and running boards. The tender also had an unpainted natural brass finish. Elektoy promoted the product with a statement in the 1913 catalog that, "There is nothing like it on the market at double cost." The retail price was $9.00, including the tender and a circle of track. Elektoy track utilized a patented third rail curved clip connector. There was one of these clips on each end of the center rail of each track section, enabling the ability to reverse the sections without having to remove track pins. The curved track was made in two diameters, 8 sections of one diameter made a 30 inch circle, and 10 sections of the other diameter made a 38 inch circle. Instructions advised the use of dry cell batteries at 4 to 6 volts to power the trains. The motors pulled one amp. The 1912 catalog stated "transformers are discouraged and are found in practice to be unsatisfactory and dangerous." A rheostat controller was available for 50 cents that featured an automatic spring lever cut-off mechanism which prevented track power from being left on, similar to the dead-man control found in real electric locomotives and rail cars. Elektoy catalogs picture several items which may never have actually been produced, or that were produced in very small quantities, but were not sold widely, since these items have rarely shown up in collections. Among these are the #937 small special passenger car, #921 shorter electric type locomotive, #903 tank steam type loco lettered #976 (similar to a Lionel #5), #901 4-wheel trolley, and the #902 8-wheel twin motor trolley, both lettered 'PUBLIC SERVICE', the latter using a standard Elektoy passenger car body. 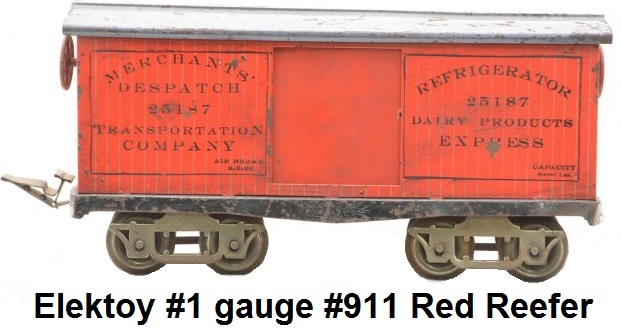 Also rumored to exist but not proven are the #910 orange livestock, #912 orange caboose and #938 yellow oil car. It is unknown how much the small Elektoy switcher sold for because it was not cataloged. There are only 6 of these locomotives known to exist. Elektoy is known to have catlogued 13 different complete ready to run train set outfits, but not until 1913. In 1911 and 1912 it is believed that train sets were not catalogued, only individual train cars and locomotives were listed. The Elektoy Trains were only sold wholesale to just five main distributors located in New York, Philadelphia, Chicago, St. Louis, and San Francisco. Only these five distributors supplied catalogs of the line through their retail small store channels. The line was not available in any of the larger better-known department stores, but instead was found in the smaller neighborhood electrical and hardware stores. Around these five train distributor outlets, and near them, is where Elektoy was sold, and is still being discovered. For example, some occasionally turns up in the St. Louis vicinity near where the Linze Electrical Supply Company, one of the distributors that was located there. The 1913 catalogue emphasizes that "the manufacturers do not sell goods at retail, order from your dealer". In the war period of 1917-1918 train manufacture was permanently discontinued, due to rationing, and the company faded completely from sight after World War I.